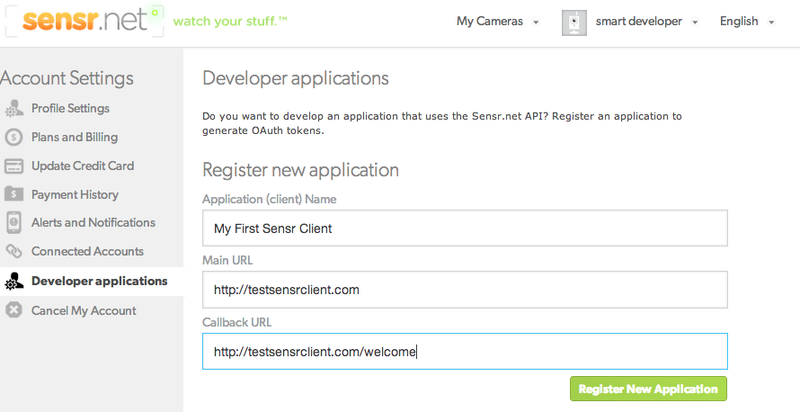 The Sensr.net APIs allows you to programmatically access content from cameras on Sensr.net. For example, with the API you can write a ruby program to build a time-lapse from your camera images, or extract motion trends across several weeks. The first paragraph consists of a quick start guide. The second introduces a couple of examples and tries to explain the guiding principles behind the Apis and how to better leverage them. The Sensr API uses the OAuth 2.0 Protocol for authentication and authorization. So the first thing we'll ask to do is to get an Sensr.net OAuth2 token. The Sensr.net API is restful and mostly self documented. The API cross-links with URL between different resources and the top level API entry point https://api.sensr.net/u/v3/resources.json always documents all resources available to the developer. 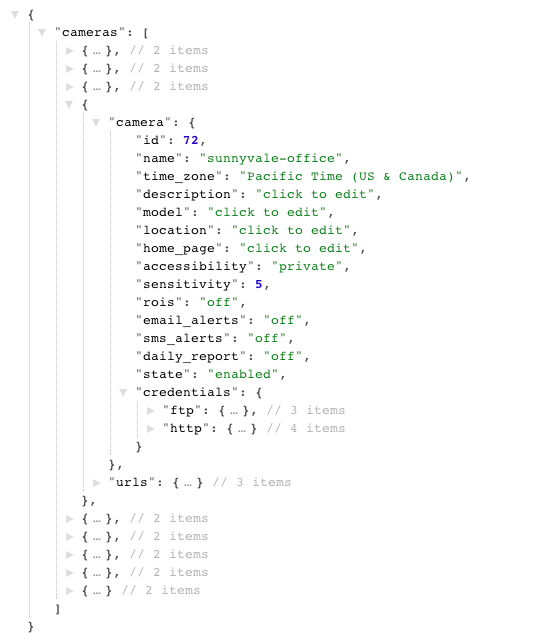 The API returns JSON and partial ruby binding are provided as a gem. This is a 5 minute guide that should get you started and running quickly. You will need an account on Sensr.net to get access to your Api keys. You will also need to have the curl command line tool installed in your environment. Assuming everything went well, you should now be seeing you api client ID and client secret, as well as one API token. At sensr.net, we use the excellent API documentation tool Swagger. Swagger is a specification and framework implementation for describing, producing, consuming, and visualizing RESTful web services. The easiest way to access your API sandbox, is to head over to you developers applications page. Look for a API Documentation link on the upper corner of the web page. This is a three step guide that should get you started and running (in ruby) quickly. You will need an account on Sensr.net to get access to your Api keys. Run the following commands to install the official sensr.net gem. Refer to this previous section to get an Oauth token. Grab the OAuth token from the "Developer application" page and save the code below in a ruby file sensr_api_test.rb. Make sure you replace the MY_API_TOKEN before running the script with ruby sensr_api_test.rb. You will find several short ruby programs under the examples directory.